Let's face it: The name "Boogiepop" doesn't exactly sound like one that would be attached to an otherworldly apparition. Truth be told, it sounds almost like the name of a previously undiscovered Pokemon ("Boogiepop! Disco Bubbles attack, now!"). Yet the real Boogiepop, the main character who lurks in a 12-episode anime series, two manga series, a live-action movie and 14 novels in Japan to date, has much more murky roots. Boogiepop's true identity is as a merciless agent of death preying upon runaway high school students. On second glance, though, perhaps he's a benevolent soul who seeks to save the world, not destroy it. Then again, perhaps he is actually a she. The mystery over the true identity of this cloaked figure is a fitting metaphor for the franchise that bears its name. The answers have never been simple to decipher; what might seem to be one thing taken at face value could actually turn out to be something completely different later. Anyone expecting a quick hit of entertainment, something that can be read or watched in a day, digested, fawned over and easily forgotten, won't find that here. The best parallel that can be made in terms of storytelling style would be "Serial Experiments Lain," the anime that appeared at first glance to be about the life of an average girl and lingering shots of humming electrical wires but actually turned out to be a commentary on the nature of human existence, connectedness and identity ... with lingering shots of humming electrical wires. But like "Lain," patience is a virtue with the "Boogiepop" franchise. Carefully follow the narrative, watch and read several times if necessary, and be patient with the mysteries, and the payoff at the end will be immensely satisfying. WHERE TO begin sorting out this mystery can be a bit of a mystery in itself. 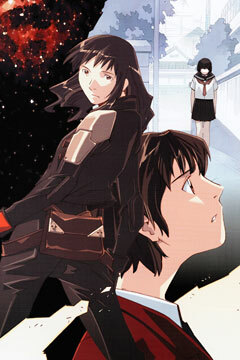 Right Stuf translated and released the "Boogiepop Phantom" anime series in the United States in 2001, four years before it licensed and released what could be considered a prequel to the anime, the live-action movie "Boogiepop and Others." Seven Seas later picked up the license for the "Boogiepop" manga and novels, releasing the novel on which the movie was based in February and quickly following that up with the "Boogiepop Doesn't Laugh" two-part manga series. The company now is in the midst of releasing the "Boogiepop Returns VS Imaginator" two-part novel and the "Boogiepop Dual: Losers' Circus" two-part manga. Yet Japan saw a different release schedule: the "Boogiepop and Others" novel debuted in 1998, followed by "Boogiepop Returns," "Boogiepop Phantom," the "Boogiepop and Others" movie, "Boogiepop Dual" and "Boogiepop Doesn't Laugh." While it could be argued that either "Boogiepop Phantom" or "Boogiepop and Others" works equally well as jumping-on points for the franchise, the foundation that the latter title establishes appears to serve as a better primer to the events that follow. "Boogiepop and Others" (as well as the manga adaptation, "Boogiepop Doesn't Laugh") focuses on the students of Shinyo Academy and an odd phenomenon: Female students appear to be running away and disappearing, only to turn up dead later. Many of the surviving students believe it is the legend of the shinigami, or death spirit, named Boogiepop who has come to life. Yet while the students see only what's going on at the surface -- and it is mostly through their perspective that we see events play out -- there are much more complex forces at work. Nagi Kirima, for instance, might seem like a delinquent to her classmates, but she's after something much greater than, say, passing a college entrance exam: She's looking for the Manticore, a shape-shifting entity who feeds on other people. The Manticore, who is currently in the form of one of Kirima's classmates, gains an ally in Masami Saotome, and together they use a drug that destroys people's minds and turns them into drones ripe for the feeding. Joining Kirima on her search for the Manticore are Boogiepop and Echoes, an entity with odd ties to the Manticore who, in his present form of a disheveled man, can read minds yet can only repeat what people say. A BEAM of light at the climax to "Boogiepop and Others" becomes a focal point in "Boogiepop Phantom." This time, though, the action expands beyond Shinyo Academy as the supernatural abilities present in Manticore and Echoes awaken in more people throughout the city. The lines between reality and illusion become further blurred with the appearances of characters like Poom Poom, a Pied Piper-like figure who describes himself as a "messenger of happiness" and passes out balloons that drain people's souls, and Manaka, a giggly girl who has the ability to conjure up butterflies of light that contain people's memories. Once again, Nagi Kirima and Boogiepop go on the search for the source of all the trouble. Another layer of intrigue is added with the "Boogiepop Returns VS Imaginator" novels, in which it is revealed that all of the supernatural phenomena taking place might be the responsibility of the shadowy Towa Organization. This group hopes to contain anyone who exhibits psychic abilities or advanced evolutionary behaviors. "Boogiepop Dual" explores how the mantle of Boogiepop can pass from person to person. Complicating matters even more is the nonchronological form the narrative takes throughout the novels, anime, manga and movie. Storytelling media often take an A-to-Z approach of recounting tales; the "Boogiepop" stories never take that route, preferring instead to take the form of "A to L back to A, then jump to Z before returning to Q and M, touch upon J a few times and THEN go from L to Z, with a few stops at N, K, J again, W and G."
Confused yet? Have a cookie. Anything less than a full doctoral thesis could only hope to begin to scratch the surface of describing what this franchise is about. Right Stuf and Seven Seas both do excellent jobs making the series more accessible to the American audience; Right Stuf through the DVD commentaries by producer Jeff Thompson and other production staff, Seven Seas through Lesley Smith's "Boogiepop: The Ultimate Guide" essay, available both in the books and online at www.gomanga.com/news/boogiepop_ 01.php. The "Boogiepop" franchise might not be for everyone, but those who enjoy complex thrillers will be in for a fun ride.